This Picture Frame Allows the User to Leave it Attached to a Wall While Perfoming Sign Updates! This Picture Frame is One Our More Elaborate Metal Poster Frames! Get the Ready Made Photo Frames You Need at Wholesale Costs! 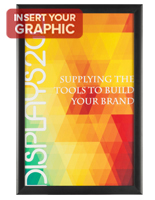 This picture frame is equipped with a front-loading design, which makes it incredibly simple to update your presentations. 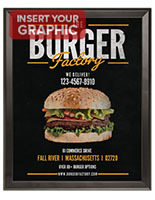 The wall-mounting sign holders offer snap-open molding, which flips out to free up the displayed graphics. 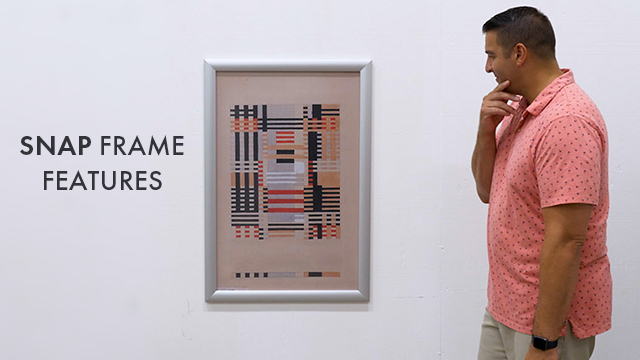 The picture frame includes a hinge on all four sides, which allows users to keep the display mounted when inserting new art or prints. The black photo holder does not necessitate any additional hanging hardware or tools to set up. 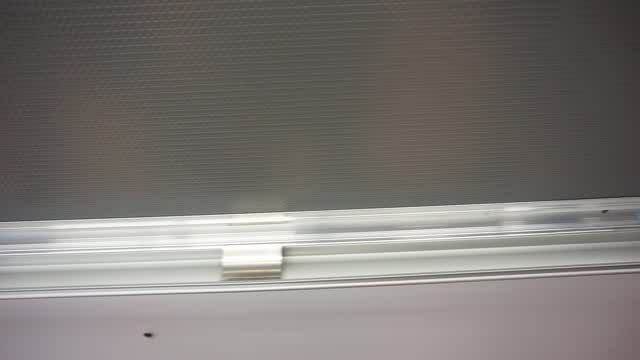 Just install the included screws and anchors into a flat surface. 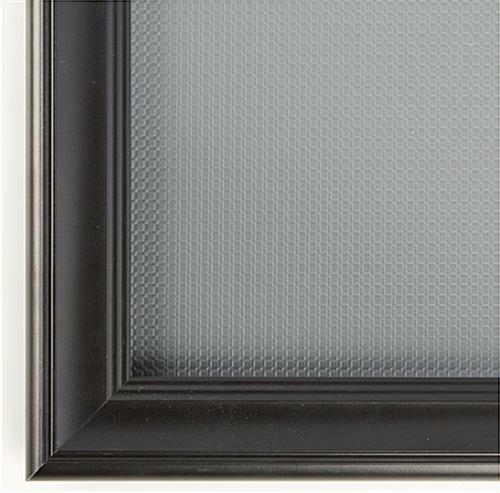 The picture frame, also known as a snap-open sign holder, has mounting holes that are positioned beneath the molding. This hidden design makes a sign look professional and enables it to match with any atmosphere. 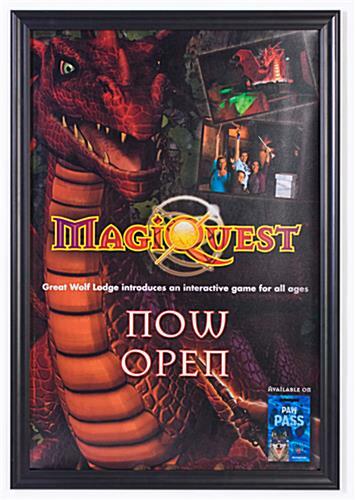 This picture frame is therefore ideal for those looking for long-term exhibits that have the ability to update quickly. This black photo display is equipped with a non-glare overlay that covers and protects signs from damaging elements, like dirt and dust. 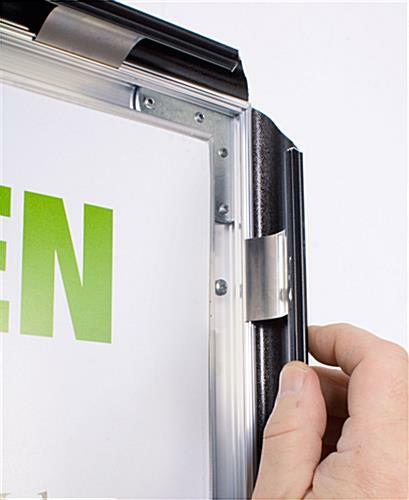 The snap-open holder is also capable of exhibiting 24" x 36" signage either vertically or horizontally. 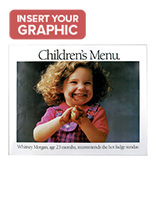 Picture frames generally provide users the freedom to incorporate advertisements or informative displays into any presentation. 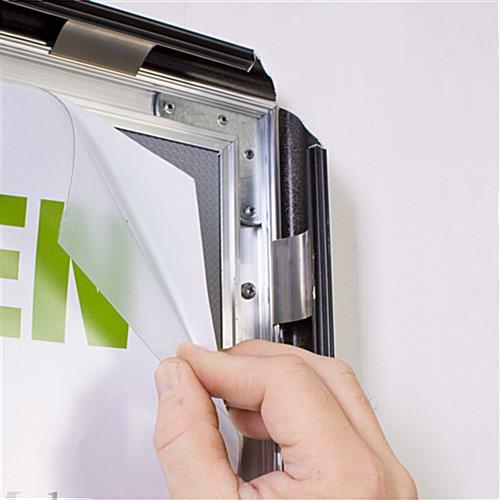 Aluminum framing, as shown here, offers a more durable and longer lasting presentational tool, perfect for retail stores, hotel lobbies, business offices or restaurants. 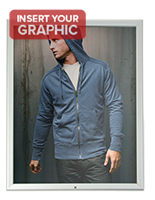 Picture frames, like the ones seen here, are a tried and true form of static advertising and marketing.